The simple line following robot circuit is given here which is constructed using L293D IC, it is a quadruple high current half H bridge driver. This is designed to provide bidirectional derive currents. 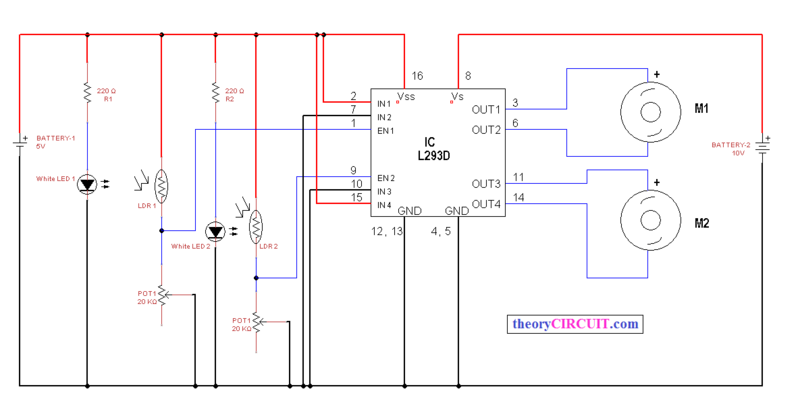 By using this circuit you can construct line follower robot without any microcontroller or without any program codes. Two motors are connected as M1 and M2 this two will reacts as Left side and Right side motors, rotation of these motors are controlled by ICL293D enable input 1 and 2, those are directly connected with two LDR (photocell) when the light intensity falling on LDR varied means the motor (M1,M2) direction will change, hence the robot continuously follows the line track, use black colour line as a track. Excuse me..Is there any video for this project? ?